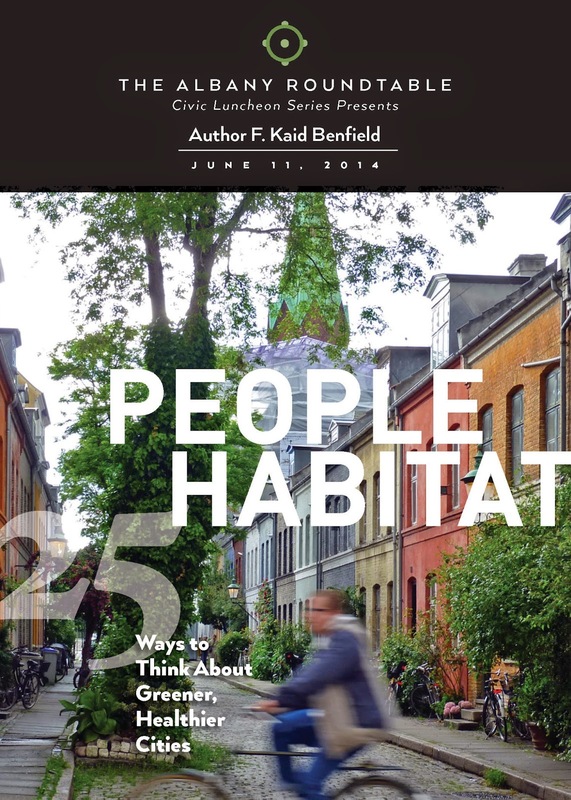 Kaid Benfield, Special Counsel for Urban Solutions at the Natural Resources Defense Council in Washington, D.C. , and author of People Habitat (Island Press, January 6 2014) , will be the featured speaker at the Albany Roundtable’s Annual Meeting on Wednesday, June 11, 2014. The event is open to the public, and will be held at the National Register-listed University Club of Albany, 141 Washington Avenue at Dove Street. The meeting will take place from 6:00 – 8:00 p.m., and will feature a social hour with cocktails and hors d’oeuvres, a short update on the Albany Roundtable Civic Luncheon Series, the presentation of the Good Patroon Award, the presentation of the Albany Roundtable Scholarship, and a talk and book signing by the Visiting Speaker. Tickets are $35 and may be purchased online . Corporate sponsors for the event are: the Capital District Transportation Committee, the Center for Economic Growth, and the Capital District Regional Planning Commission, with additional support from Empire State Future. The Capital District Transportation Authority is providing advertising partnership. Benfield is also an adjunct professor at the George Washington University School of Law; co-founder, LEED for Neighborhood Development rating system; co-founder, Smart Growth America coalition; author of several books on smart growth and sprawl, and a regular contributor to the websites The Atlantic Cities, the Sustainable Cities Collective, and NRDC’s Switchboard. He was selected as one of the world’s “top urban thinkers” on the city planning website Planetizen and one of “the most influential people in sustainable planning and development” by the Partnership for Sustainable Communities. At the evening reception, the Albany Roundtable will present its Good Patroon Award to Hon. John J. McEneny for his career in public service including nearly 2 decades in the New York State Assembly, his work as Historian of Albany County and his continued commitment to community leadership. The Good Patroon Award was established by the Albany Roundtable in 1988 to recognize outstanding contributions to the community by institutions and individuals. The Albany Roundtable will also present a $1,000 scholarship to Cara Waterson, a senior at Albany High School, for demonstrated civic leadership. The Albany Roundtable’s previous Visiting Speakers have included Jeff Speck (Walkable City); John Norquist (CEO, Congress for the New Urbanism); Janet Flammang (The Taste for Civilization); Colin Beavan (No Impact Man), Jaime Correa (planner, architect and professor at the University of Miami); Stan Eckstut (NYC architect, Battery City Project); Tony Hiss (Project for Public Spaces); Robert McNulty (Partners for Livable Places); Paul Pritchard (National Parks and Conservation Association); Richard Bradley (proponent of Downtown business districts); Ray Oldenburg (The Great Good Place); James Howard Kunstler (author and new urbanist); Jane Holtz Kay (architecture critic, author of Asphalt Nation); Joseph P. Riley (Mayor, Charleston, South Carolina); Richard Reinhart (Buffalo Place); and others. Tickets for the reception must be purchased by Friday, June 6. For more information, visit www.albanyroundtable.com, email albanyroundtable@yahoo.com or call The University Club at 518-463-1151.